This is an impressive collection of transcriptions from J.S. Bach’s organ or solo violin or cello works, with some of his arrangements of concertos and sonatas by other composers such as Vivaldi. The origin for each of the pieces is given in interview form, with Skip Sempé outlining the BWV numbers and adding some anecdotes about ‘outtake’ tracks such as the Prelude BWV 1010, a cello suite movement improvised from memory and included in the spirit of spontaneous improvisation. The results are a kind of ‘swinging’ variation on a recognisable but admittedly distorted original. 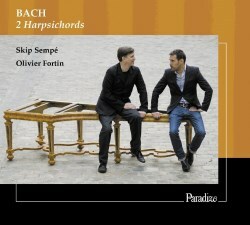 The glory of this recording is that it is, arguably, a harpsichord CD for people who don’t like the harpsichord. The two instruments made by Bruce Kennedy modelled on historical examples are superbly matched, and the added resonance of both instruments together is gorgeous throughout. The recording is fairly close and detailed, but by no means headache-inducing, and the colour and effect is, to my ears at least, sublimely attractive. Slower movements such as the Adagio in D minor, BWV 974 are for the most given nicely spread chords, a technique that allows tonalities to be heard more clearly than if they are struck simultaneously – an effect that is however tellingly dramatic as used towards the dark conclusion of this movement, originally from an oboe concerto by Marcello. There is a tradition of playing music on multiple instruments, most of which for Bach are transcriptions of earlier works, but also substituting for strings in a way which allowed for the performance of concertos and other larger-scale works in a domestic setting on two pianos up until the early twentieth century. Sempé outlines the importance of fine instrumental accompaniment and the “essential procedure” of being able to accompany “someone who plays on his own instrument before attempting to accompany someone who plays another instrument, or sings.” This is an art of learning to listen to oneself and a process of synchronisation that turns the more common procedure of developing fine individual technique before starting on ‘accompaniment skills’ on its head. Sempé also outlines his and Olivier Fortin’s ideas about transcription, experimenting with having “one harpsichord amplifying the other”. The glorious resonances in something like the Larghetto in D major, BWV 972 owe their sound to these musicians’ openness to experimentation and exploration of the qualities in their instruments, and in rediscovering techniques that would have been common in the distant past. No doubt with tongue somewhat in cheek but with never a truer word, Sempé replies to the question “what do we really know about the performance of all this music from the time of Bach?”, “One thing is certain beyond any doubt: none of it was ever meant to be recorded.” Indeed, the only way to record music in Bach’s day was to write it down for others to reproduce to the best of their ability, and I would be prepared to lay bets that it would rarely have been heard with the remarkable quality and qualities preserved in this excellent recording. There are some remarkable tracks here, and from the dark drama of the Adagio in A minor BWV 965 to the fabulously urgent and richly orchestral Preludio in A major BWV 1006 and just about everything else in between, I defy even the most hardened anti-harpsichord person not to raise at least an eyebrow, and, I hope, a wide grin. With a programme filled with familiar and less well known music by J.S. Bach or sprinkled with his magic dust as an arranger, this is as exciting a harpsichord disc as I’ve heard for many a year.